Relocating a restaurant is always an exciting challenge for the Fitzgerald Moving & Storage team! We're ready to help make your relocation a success, from the moment you contact us. You can rely on Fitzgerald Moving to think ahead, plan for every eventuality and ensure exceptional service at all times. The Washington area is home to numerous thriving restaurants, from pizzerias to burger bars, pancake houses to sandwich shops. 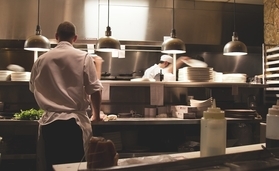 Whether you manage an expansive restaurant or a small café, we have the team for you. We're dedicated to providing the best relocation services to restaurateurs throughout the Washington metro, including areas of Maryland and Virginia. If you are a restaurant owner or manager in the DC metropolitan area looking to relocate within or away from the area, we can help! Since 1978, Fitzgerald Moving & Storage has assisted commercial companies in the Washington metro with relocation services designed to make moving easy, from packing and transporting to storing items for our customers. Contact us for your free restaurant relocation quote, further information about how we can help you with your move, or guidance as to the best way to prepare for relocation. We look forward to hearing from you, restauranteurs of Washington!